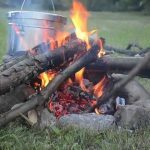 Chimineas are prone to weather-related damage, and so with this article we will describe how to properly prepare your chiminea for the freezing temperatures. 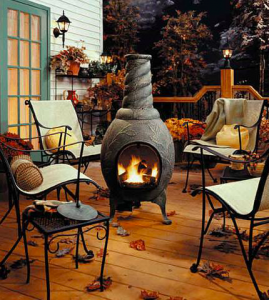 Chimineas are wonderful additions to any backyard entertainment area like a patio. The addition of live fire brings a sense of comfort and warmth. Maintaining your chiminea is an important part in ensuring its longevity so you can get years and years of use. Chimineas don’t require much summer maintenance other than the removal of ash and the occasional wash. Winterizing is a big part of chiminea maintenance. 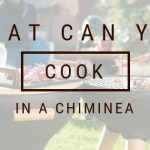 So how exactly can we prepare our chiminea for winter? Since the chiminea burns fire, doesn’t that mean we can leave it out year round for convenient use? The answer is no, sadly. They can go into shock from sudden extreme temperature change such as the frozen winter condition to a burning fire. 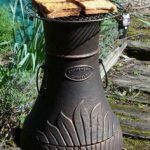 Clay chimineas in particular are vulnerable to weather-related damage, so it is vitally important to store it properly. 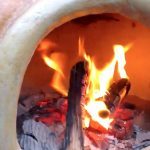 Winterizing can be as simple as bringing the chiminea inside for the season. Ideally you will put the chiminea in the shed or basement over the winter, but this may not be possible due to space issues. If you are keeping it outside, you will have to get a chiminea cover to keep out any moisture. Cast iron chimineas also need to be wrapped as the iron is prone to rust. Keeping it dry will prolong the life of your chiminea and keep it in tip-top shape. Some people may prefer a rustic, weathered look. Remember that water will always creep where it can, so even on a steel chiminea water may get into the joints. With a clay chiminea, use a padded cover. The padded cover will keep out frost. 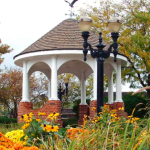 You can use a regular waterproof cover during the warmer months. A cover will also prevent UV rays from getting in and damaging the chiminea. Clay is porous, and this means it will absorb moisture. 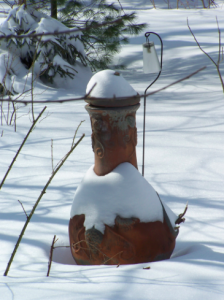 When the chiminea is left outside in freezing temperatures, the moisture absorbed will freeze and expand inside the pores, thereby causing cracks in the surface of the clay. These cracks will weaken the integrity of the chiminea, shortening its lifespan. Most chimineas will come with a rain lid that covers the smoke stack, in order to prevent rain getting in. Water will pool in the belly, so make sure none gets in! You will also want to stop animals getting in. In the winter months they will be looking for cozy and convenient holes to burrow in. You will have to keep them out so they do not nest or leave feces in your chiminea. Note: if your chiminea does get wet, and you want to use it, let it dry as much as possible. You will then light a small fire, and very gradually grow the fire so the chiminea dries in a fashion that is not too fast. If you don’t want to put out a lot of money for a real cover, you can use a tarp. Tarps are waterproof and will serve the purpose of a cover, but you won’t have the custom fit and shape of a chiminea cover. This will involve a bit more work as you have to wrap the tarp in such a way to ensure it is properly sealed. Your best bet is to bring the chiminea inside over the winter. Exposure to extreme temperatures will damage it. As mentioned, the moisture will be absorbed by the porous clay. In the daytime when the sun is on the chiminea, this might not seem like a problem but by nightfall, the water will freeze and expand inside the clay, forcing it to crack. Once they are cracked, the damage is irreversible and only gets worse. 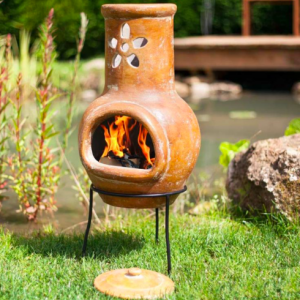 Traditionally, chimineas are made of clay. More recently we have seen cast iron models and even more recently, aluminum. 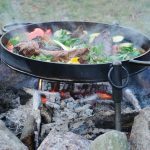 Aluminum chimineas weigh less than clay and iron and for this reason they are much easier to bring inside for the winter. 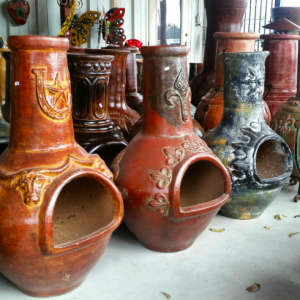 Clay chimineas are extremely heavy and prone to breakage should you drop them during transport. They should be moved on a dolly or moving cart and with the help of two people. 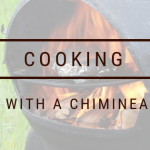 Chimineas are made in two parts: the smoke stack and the belly, and then sealed together. For this reason you should always lift by the body, never the neck. Note: do not use the chiminea once it’s inside the house. You will get carbon monoxide poisoning or burn your house down. You may find it easier to leave the chiminea outside and wrap it properly. Your chiminea should always be raised from the ground. 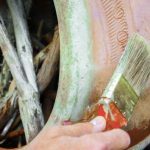 Make sure it is raised during winter too so as to avoid water-related damage, on a wooden base or brick platform. Clean the chiminea thoroughly of ash and soot before storing it for winter, whether you leave it outside or bring it in.